Mint (Mentha spp.) encompasses an estimated 600 varieties of herbs grown and used for culinary purposes. Some common garden varieties include spearmint (Mentha spicata), peppermint (Mentha x piperita) and several fruit-flavored mints. These perennial herbs thrive in U.S department of Agriculture plant hardiness zones 5 through 11 depending on the cultivar. As a perennial, mint returns every year in larger clumps. Mint thrives in a sunny to partially sunny location in fertile, well-drained soil that is evenly moist. A location that receives full sun in the morning and afternoon shade works well in warm climates. Adding a 2- to 4-inch layer of organic matter such as aged manure or finished compost to the soil when preparing the soil improves aeration and drainage and provides mint plants with slow-release nutrients. Mix the organic matter into the top 6 inches of the soil with a trowel or rake. Add 1/2 tablespoon of fertilizer (16-16-8) to each square foot of gardening area at this time and work it into the soil. 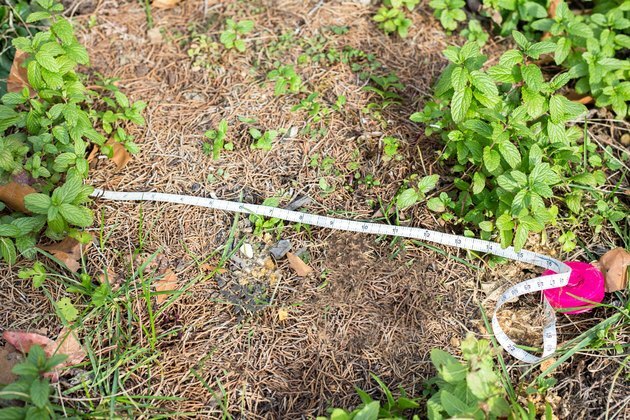 This provides the nutrients mint plants need to get a good start. Mint plants require room for the foliage and roots to grow. Space them 12 to 24 inches apart or plant one to two seedlings in a 12-inch container. Plant seeds 4 inches apart in rows spaced 24 inches apart. Thin the seedlings to stand 12 to 24 inches apart when they are 2 to 3 inches tall. Mint needs one to two inches of rain per week. When Mother Nature does not cooperate, give plants supplemental water once or twice a week to moisten the soil to the root level. 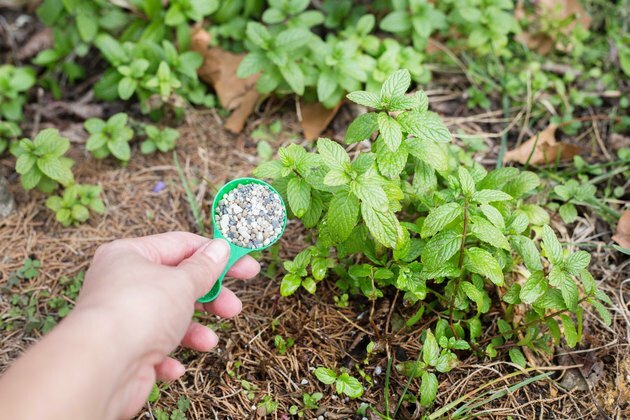 Avoid fertilizing mint other than at planting time and each spring with new growth appears. Apply 1 teaspoon of 16-16-16 fertilizer to each plant in the spring when the first leaves emerge. 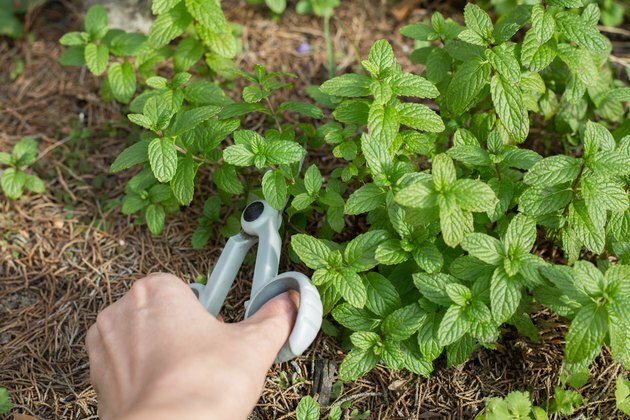 Mint is an aggressive grower and can quickly take over a garden. For this reason many gardeners prefer to grow mint in containers. 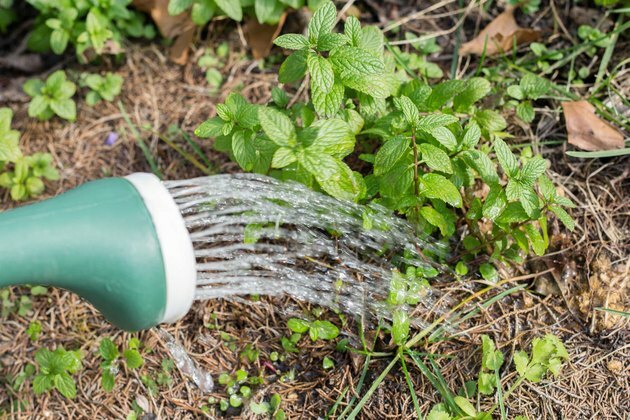 Alternately, sinking a gallon can with the ends cut off into the ground and planting mint inside creates a physical barrier to contain spreading roots. Cutting mint back to the ground level several times during the summer encourages compact growth and prevents it from becoming gangling and toppling under its own weight. 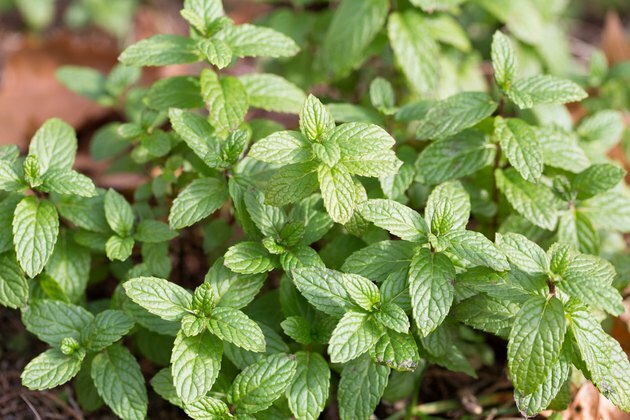 What Are the Different Types of Mint Plants?